If you were to look back at how your organization has handled certain initiatives over the years it might look like they are in a repeating cycle of trial and error. 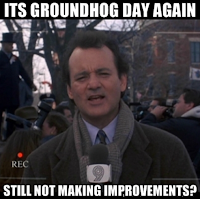 For those who may not have seen the movie “Groundhog Day” it is a story about a weatherman (played by Bill Murray) who wakes up every morning and it is February 2nd. No matter what he does throughout the day he will wake up the next morning on February 2nd - Groundhog Day. There are times where we might find ourselves in this same type of endless loop where no matter what we do, we end up at the start with no measurable improvement. The trick here is to start to think why it hasn’t worked in the past. It is likely that we already know, and understand why we are in this seemingly endless loop. In fact we are probably complaining about it in repeat mode to just about anybody who will listen. The first step is to stop and really think about what is the roadblock for getting your goals accomplished. When we run through this exercise, don't focus on only immediate constraints, think bigger scale. For example if it is related to someone in leadership who is challenging this activity. Understand what is preventing them for seeing things in a way which moves us forward. Avoid the blame game as this is never going to help produce results. As an example let’s suppose that we are having difficulty getting problem management off the ground. We all know that there are many positive benefits of this activity so why are we not performing it. We know that to improve service we want to reduce the number of business impacting incidents. Sounds simple enough, so let’s break down the reasons that our example organization is not able to jump this hurdle. Instead of using this as a crutch, let's focus on how we can get around this. Many organizations will say that they don’t have the bandwidth for other activities. Perhaps we need to find a way to ensure that the teams that are impacted by the incidents have the tools to investigate and manage the issues in a proactive way. We may not have a ‘problem manager’ but by managing the work load we can reduce the waste work generated by incidents. People might just see this as ‘more work to do’ but if this added effort is marketed in a way which shows long term work reductions than we can move the needle on this. Firstly. Make sure you are working on the right things. Working on an issue which might be the result of a memory leak might be a suitable problem by the books, but we need to start thinking outside of that thought pattern if we are going to gain some momentum on how problem is perceived. Is the work and results of resolving this issue going to do that? Instead we might want to take on a problem that impacts tasks which would be better if they were automated (password resets) or even training issues that could be managed by a knowledge article. I have news for you, they don’t actually care. However they do care about what a solid problem resolution can produce - results. Learn to celebrate your successes. Communicate when you are able to achieve wins by making progress. Even if they are small to you they can build up to something substantial. 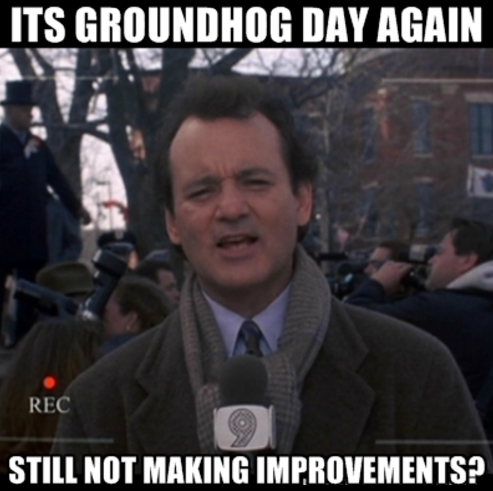 In the movie Groundhog Day the main character, Phil Connors, is finally able to escape this loop by connecting with the people in the town of Punxsutawney where he is trapped as well as sharing his experiences with them to improve their lives.